NASA has a mandate to push the technologies it develops for space out into Earth, too. So over the last few years, the agency has made more than a thousand patents available for licensing–from inflatable dwellings to humanoid robots. The so-called Technology Transfer Program has been around for a while, but this week NASA announced a new effort to pair its patents with startups, making it free for small companies to borrow technology from the agency (at least for the first few years). It’s an interesting chance to look at the huge range of Earthly inventions that come from an agency devoted to space. Amongst them are inventions that could have significant impacts on the world in the right hands–advances in battery technology, self-healing metal, and even things like biometric password based on heartbeat. The patent library actually includes many NASA-built robots, but one of the most interesting is the BladderBot: An amorphous robot designed to get over rocky or treacherous terrain without wheels or legs. Instead, it uses three bladders of liquid and a central spigot to distribute liquid into different areas, moving the bot over the surface of the Earth (or another). There are plenty of new materials in the library–in fact there’s a whole category devoted to them–and it includes a newly-minted form of aluminum alloy with better tensile properties called NASA-427. Originally developed for use in the Ares rocket program, NASA is hoping a carmaker will use it for stronger wheels or brake calipers. 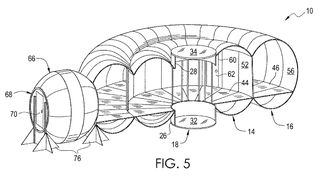 Concepts for inflatable space habitats have been around since the 1960s–in fact, this design by NASA patented in 2011 even references a 1961 design. It makes sense: In extreme environments, space included, it’s often impossible to bring the traditional construction materials needed for a habitat–hence easily foldable, stowable fabric structures that can be inflated and pressurized, like this one. NASA’s project to send a humanoid robot into space resulted in several off-shoot projects, like this one, which it calls “essentially a robot on your hand.” Like full-body exo-skeletons that let factory workers lift incredible loads, it adds strength to your actual hand while you’re working, reducing loads and making it easier to grip a tool or object for longer periods than you normally could. It’s no surprise that self-healing materials make multiple appearances on the list, but this material is interesting because it can heal cracks in metal. It’s actually a veneer that’s painted over a given part of a ship or tool. When a crack forms, the material is heated up to its melting point–which is lower than that of them underlying metal–and it liquifies to fill the crack. As NASA points out, right now this process has to happen in a vacuum–the next goal is making it easier to do in open air. We’ve heard a lot about biometric passwords this year, and NASA is also studying them: This patent for a software application uses 192 different parameters to identify a person using the waves created by their heart beating. One of the most intriguing patents on the list is still pending: Solar Powered Carbon Dioxide (CO2) Conversion. Details are few and far between, but this is a photoelectrochemical cell that NASA imagines major polluters and industrial sites could install to collect CO2 before it gets belched into the atmosphere. Using sunlight, these cells convert the gasses into fuels like methane, the patent’s description says. Exactly how is still unclear, since the patent hasn’t been granted yet. But NASA says it has developed a way to make these cells cheaply and quickly–needless to say, it’s going to be interesting to find out more about this one.